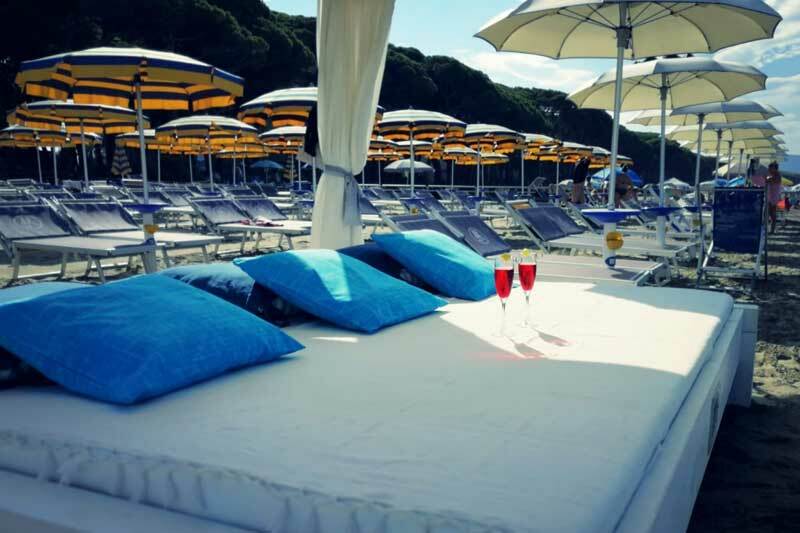 Overlooking the Gulf of Follonica, in the heart of the Tuscan Maremma and in front of the island of Elba, you will find our equipped beach and an elegant wooden structure, which we have called: “Hawaii Beach”. Open to the public, it offers a qualified and extremely comfortable beach service. This corner of paradise is embraced by a large pine forest and a white sandy beach, washed by a clean sea, ideal for a safe bath for adults and children. This is the right place for a holiday where the sea, the sun, security and relaxation are the main attractions. With us the guest comes first and can enjoy the sea the whole day, from morning to night, accompanied by our assistants and the well-stocked “Lounge Bar”. The Franceschi family, engaged for more than twenty years in this sector, directly manages the structure and will be pleased to provide all the passion, experience and courtesy to meet the needs of customers. The beach, of white and thin sand, makes of our structure a fundamental characteristic. Even barefoot is ideal for long walks without danger, the sea that bathes is safe with no holes guarantee a bathroom in total safety even for the little ones. The arrangement of the umbrellas allows a vast space between them. There is a central walkway to facilitate reaching the shoreline for the disabled and strollers.